Durong Dingo Sanctuary where pure Australian dingoes are kept safe. DURONG NEEDS YOUR URGENT SUPPORT TO KEEP OUR SANCTUARY ALIVE! sanctuary of its type in Australia and is situated in the South Burnett Region of Queensland in natural bush settings, only 75 kilometres from Kingaroy. A not for profit organisation provides peace where pure dingoes are kept safe from the perils of 1080 poison baiting, trapping, and shooting. Simon Stretton, Sanctuary Manager established breeding programmes in 2008 to ensure pure genetics live on, in addition to education programs and awareness, and experience for the local and wider community. Biosecurity Queensland has classified the Sanctuary as a 'Zoo, for film and Television Production', yet the dingoes live in a nature reserve in the bush, in safety and with protection. Increasing wild dog populations (dingo cross feral dog) are affecting the pure strain of dingoes on the mainland as well as other native species, which is where Durong comes in. While the government can be commended for trying to eradicate wild dogs, the use of the 1080 poison baiting programme has also devastated many other native species, not the least of which is the dingo. The dingo is listed as 'vulnerable' and is considered to be facing a high risk of extinction in the wild. The fate of the conservation of dingoes depends on public support. By working together we intend to ensure the survival of this iconic species and re-establish the natural balance, which is where our 18 dingoes of pure blood line come in. Durong Dingo Sanctuary provides a safe place for pure dingoes to live safely from being baited, trapped or shot. We need to treat this unique native animal with the respect it so richly deserves, through education and experiencing first hand this intelligent and intuitive creature. The mission of the sanctuary is to save and preserve all types of dingo and educate the public about the pivotal role the dingo plays in our fragile ecosystem as it is the top order predator and facilitates in keeping in balance the lives of all wildlife. Visitors are welcome to Durong, and Simon and the dingoes look forward to welcoming you to the Sanctuary and eagerly anticipate interacting with you and helping you learn about how dingoes are not your enemies, but your friends. A visit to Durong, by appointment will see you having a supervised one on one encounter with a dingo. Until then Durong Sanctuary and its precious dingoes need public assistance for the Sanctuary to survive in these tough economic times. Durong Dingo Sanctuary needs support from you to help us to maintain the sanctuary keeping the dingoes healthy and safe, maintaining and building new enclosures at a cost of $8,000 each and maintaining vehicles used in rescue and educational work. As a not for profit organisation coming under the umbrella of South Burnett Wildlife Rescue and Rehabilitation, a charitable organisation, we need your help to keep the Sanctuary operating. If we reach our target goal Durong will be sure of worry free operation for years to come. Please, will you chip in to help keep the Sanctuary operating? WE URGENTLY NEED COMMUNITY HELP TO KEEP OUR SANCTUARY ALIVE. Durong Dingo Sanctuary is home to Australian pure dingoes in rural Queensland, Australia. Please help us to protect this threatened species. By adopting a Dingo with your generous donation, you will be adopting and sponsoring one of our Dingoes for two years. 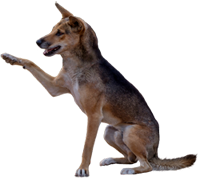 You will receive a Certificate plus a photo of your Dingo and invitation to visit the Sanctuary to interact with your adopted Dingo with Simon with photo opportunities for you with your adopted Dingo. You will also receive a complementary T Shirt to mark your visit and donation. Est. Delivery Date: Fourteen days. Lifetime membership of Durong Dingo and Wildlife Sanctuary. Adoption of a dingo, photo of dingo, complimentary T Shirt and personal introduction to your "adopted" dingo with Sanctuary Owner and Manager, Simon Stretton. Est. Delivery Date: By arrangement.